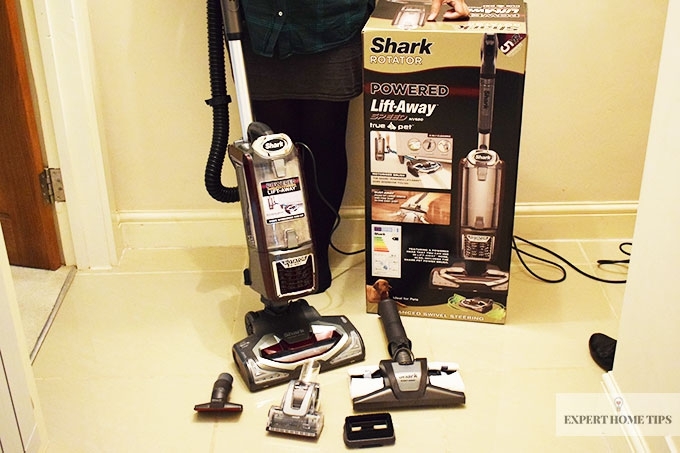 I'd heard of Shark Vacuum Cleaners and it sounded like they were made for me. I recently moved home and it appeared like the previous owners had never clapped eyes on a vacuum cleaner. I have a pet allergy, which, despite my love for animals, means that I suffer from a sneezing fit, streaming eyes, and a twitching nose if I spend too much time with them. Unfortunately, a rather large dog had lived in the house before me - this coupled with the previous tenant's inexplicable aversion to vacuuming, resulted in a shocking amount of dirt and fur embedded in the carpet. To top off my ailments, I also have a dust allergy. You can imagine the state I was in - an ugly, irritated one. To help get rid of the pet hair we purchased a well-known leading vacuum cleaner for a lot of money- we were desperate. This particular model was incredibly bulky and quite difficult to heave around the flat. 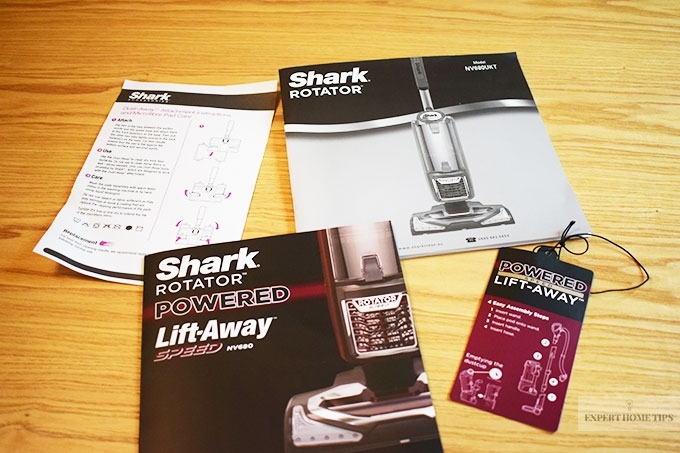 A friend was waxing lyrical over a new vacuum cleaner she had bought after seeing it advertised on television - the Shark Rotator Lift-Away. She made it sound like The Best Thing Ever - it had revolutionised her life, she couldn't believe its powers... so I decided to give it a go. 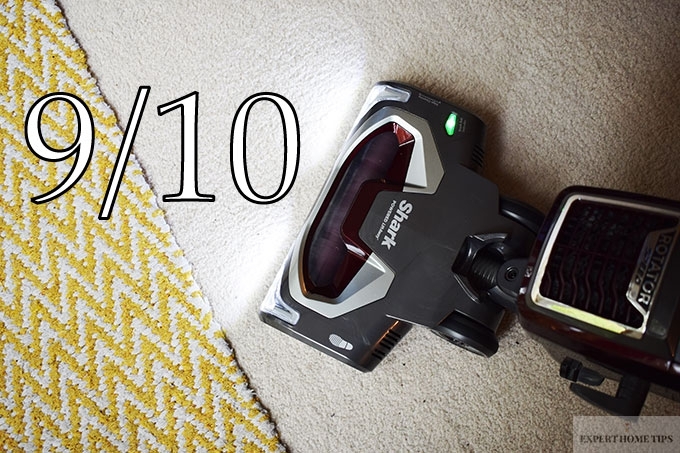 Having put the machine to the test, we've decided to award the Shark Rotator Lift-Away vacuum cleaner a score of 9 out of 10. I took the vacuum cleaner home to use on the carpet in the living room and bedroom. It was also put to test on the hard floor in the hallway and bathroom. 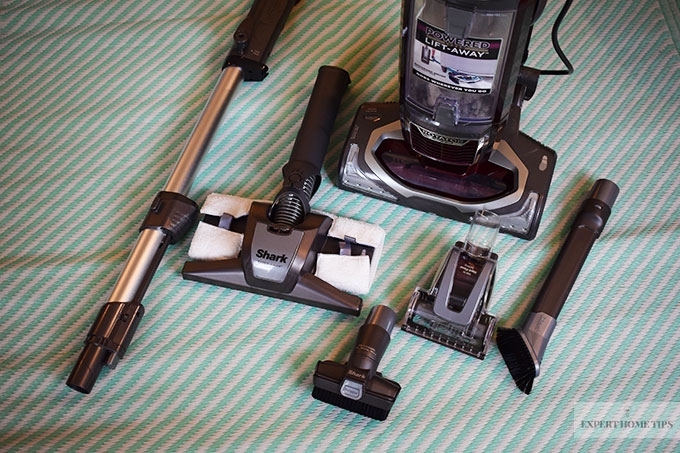 You can read an account of my experience with the vacuum cleaner below. Currently, Amazon are selling the Rotator Powered Lift-Away for £199.99. The usual price for this cleaner is £299.99. I'm not really a fan of products that are tricky to assemble and the Shark Rotator was the opposite - incredibly easy. You can pretty much guess how to put it all together without even looking at the manual. The instructions come in the box, and you can look forward to a detailed instruction booklet which contains helpful information on all the different ways you can use the vacuum cleaner, as well as a handy leaflet on the Dust-Away attachment and Microfibre Pad Care. There is also a label which I took off the cleaner which shows you the 4 assembly instructions, how to empty to the dustcup and a quick guide to the fingertip controls on the back. Finally, there is another condensed guide with helpful illustrations on how to use the cleaner. This mini label would be perfect to hang on the Shark handle while people in your household get used to the new machine. Instruction booklets for you to look at. After putting the vacuum cleaner together I decided to tackle my living room floor using it in the upright position. Lo and behold, the dog hair was sucked up into the dustcup. Given that a dog hadn't set foot in my home since we moved in, it was amazing to see the Shark doing such a great job already. It also has an LED light on the front to help you spot unwanted dust that may be missed. A handy button can be found on the front of the machine so you can switch between hard floor and carpet. There's also an easy Suction Control setting which you can set between Min and Max depending on how strong you want it. You'll be surprised at just how powerful the suction is - it will lift your carpet pile. My friend had a thick carpet and it pulled it up so much that you could make footprints on the carpet when you walk over it - something that hadn't been seen in a long while! Next, I pressed the LIFT-AWAY button which lifts the pod off the motorised floor nozzle. 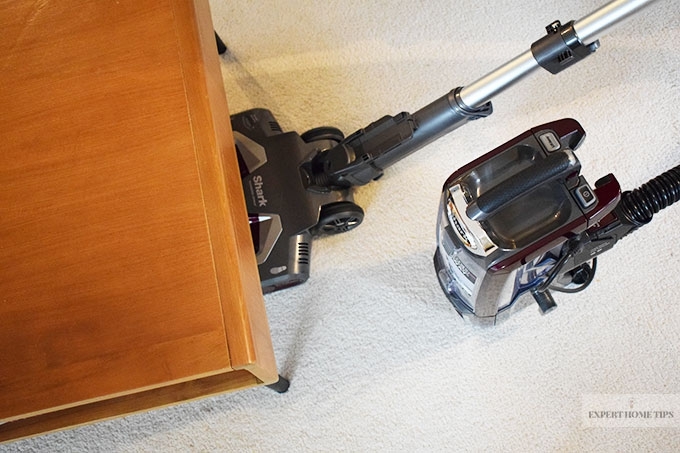 That's right - at the click of a button, you can change the Shark Rotator Powered Lift-Away from an upright to an easily portable vacuum. I personally don't have any stairs in my home, but this would make vacuuming them a breeze. The pod is super light, small and easy to transport. The 2-in-1 Crevice Tool is pretty nifty. 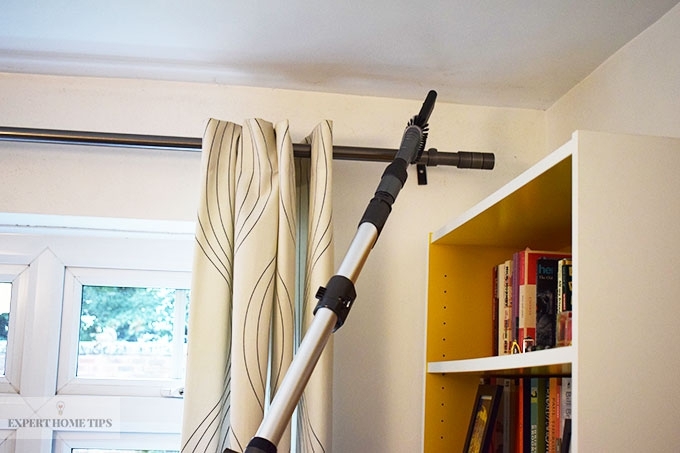 Not only does it work as an extender for when you need to get to those far-to-reach corners, it also has a dusting brush which will enable you to clean a variety of surfaces. It doesn't lose any suction like you'd expect, so it's great at finding those pesky dusty areas. It makes terrifying jobs like cobweb-removing easy. 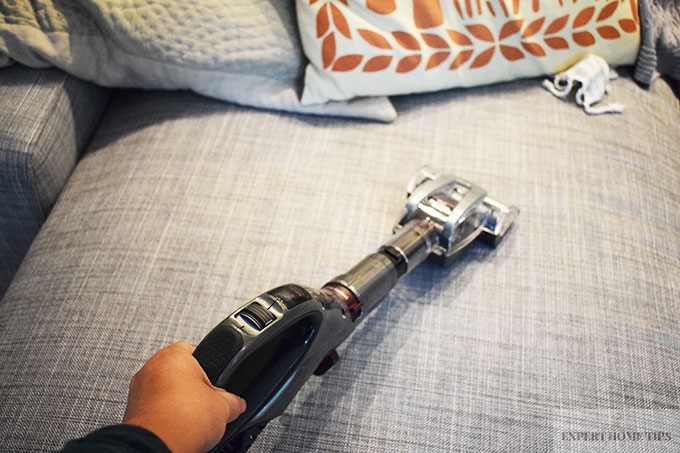 Pod in one hand, wand in the other, your new handheld vacuum is light and easy to manoeuvre around the room. So long corner-dust! If you need to get underneath a coffee table, all you have to do is unhook the pod, attach the motorised floor nozzle and you're off. 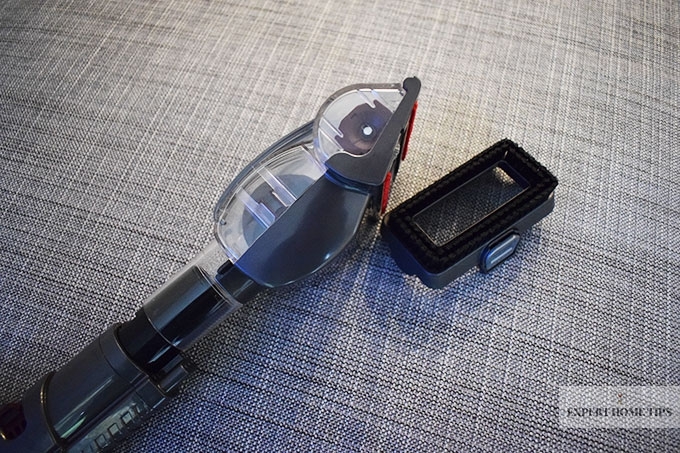 The motor means the brush is powered, making vacuuming simple. As a short, relatively weak human, I'm seriously impressed with the steering manoeuvrability and the swivel steering of the Shark Rotator - it's light and manageable. Currently, I own an upright from a leading brand, and it's far more tricky to move around. You can also insert different tools directly onto the handle for jobs like upholstery cleaning. If you have a pet cat who likes to sit on a particular cushion, the Pet Power brush is designed for them. Do you own a dog that's brought in the dirt on their paws from their walkies? Take out the brush to remove it from carpeted stairs and on your furniture. 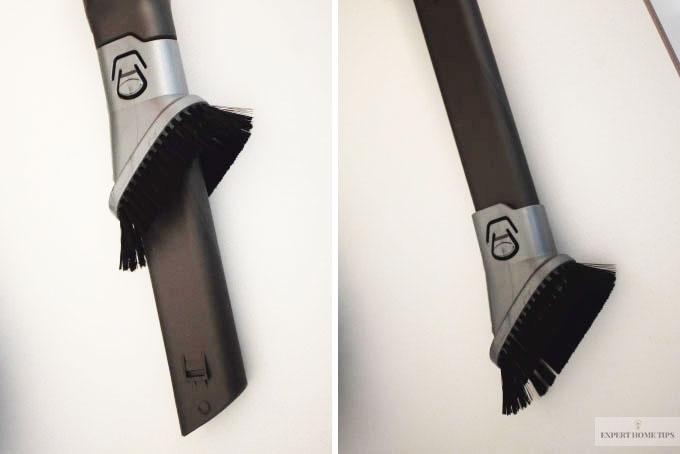 The Articulated Upholstery tool has two cleaning tools for the price of one - an upholstery tool which will help remove the pet hair, and a stiff bristle brush that gets rid of stuck-on debris of lots of different surfaces. I have beautiful tile floors so this Dust Away Hard Floor Attachment & Microfiber Pad is most welcome. After a quick push of the button to adjust the Shark to hard floor cleaning, I can now use the Dust-Away attachment to lift dust and large debris away. 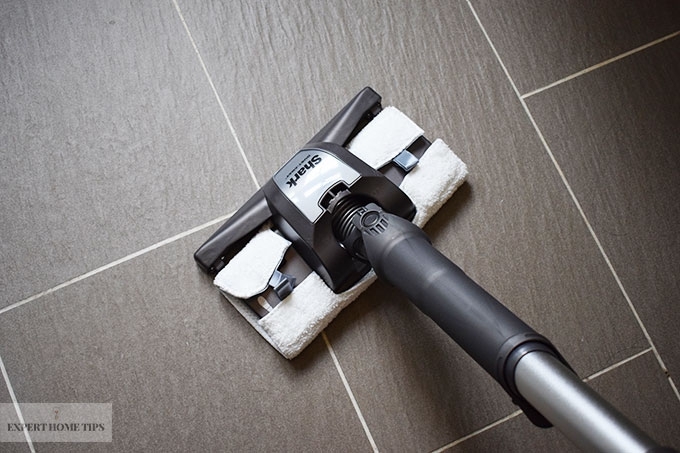 It's perfect for dusting tile floors and gentle enough for use on hardwood floors. Thus concludes my journey with the Shark Vacuum cleaner. The carpet looks spotless and the pile has certainly been lifted. The amount of dust and dirt that came out of the carpet was unbelievable and I can't wait to try it again - and that's saying something - I hate cleaning! I loved having a play with the Shark, it was wonderful to see the pile come up and the dust removed. It's light and easy to use. According to their website 3 out of 4 prefer the Shark Powered Lift-Away TruPet to the Dyson DC40 Animal and I'm not surprised. The suction is fantastic, the LED lights are marvellous, the steering is easy and the ability to turn it into several different cleaning modes is wonderful. The detachable pod turns it into a whole other machine! 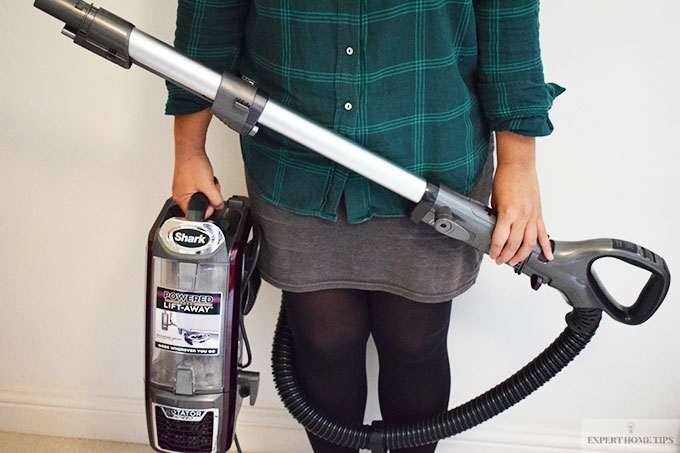 This particular Shark vacuum features an anti-allergen complete seal technology that holds over 99.9% of dust and allergens inside the vacuum cleaner and certified by the British Allergy Foundation. This means that all that stuff does not go back into the air whilst you're using it - perfect for someone like me who suffers from a dust and pet allergy. Overall the Shark Rotator Powered Lift-Away True Pet Upright Vacuum Cleaner will surprise you. I will definitely be recommending it to everyone I know. We have decided to award the Shark Rotator Powered Lift-Away True Pet Upright Vacuum Cleaner 9/10. I hope you enjoyed our review. 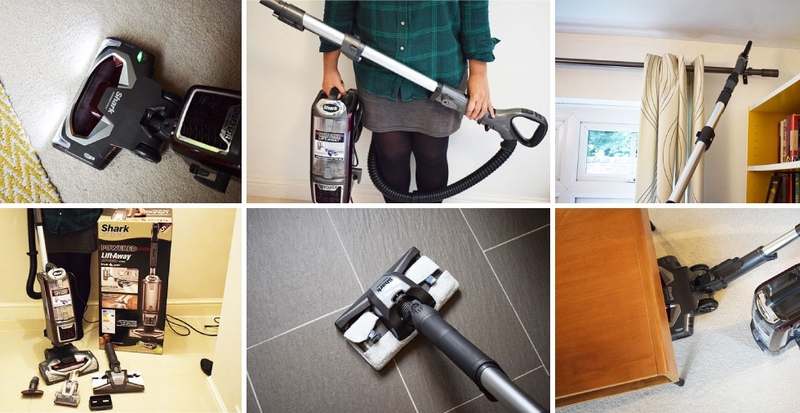 Let us know what you think of the cleaner in the comments below and please share our blog post with anyone who you think might be interested in a new vacuum! For more information visit the Shark Website. A very excellent and informative review. Loved the voice of the article and the great photos. Thank you sincerely for your time in creating this fabulous, informative piece -- very, very helpful. hugs! Hi Walkfly - so glad you liked the review :) Thanks for stopping by. Nice Post. It's a very helpful blog that provides information about shark rotator powered vacuum cleaner. Thank you so much for posting the above information. I will definitely recommend to use this vacuum cleaner to everyone. As a Dyson user (Have had three over the course of 10 years. ), I was wary of the claims of how good this machine was but BOY, was I wrong! I found it to be very good at removing the hair from carpets, area rugs, and wood floors left by my two fur babies. Our lab's hair was always a problem but this machine did the job BETTER than my Dyson. Needless to say, I am now a Shark fan and will continue to use this brand as long as they continue to live up to their claims.